This is one of those old Ace doubles, which means two books in one. One side has one cover and you flip it around and on the other side is the cover for a different book. This was used a lot for sci fi (and probably mysteries, too). You could take two books of less than 150 pages each and package them together. 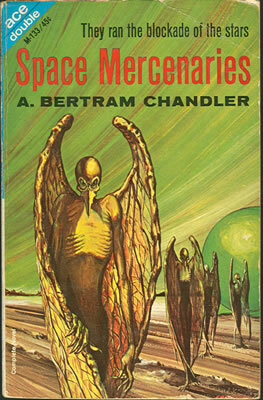 The flip side is a novel called The Caves of Mars, but I have so far only read Space Mercenaries. I started with that one because… c’mon, space mercenaries. How cool is that? It’s apparently the second in a sort of trilogy known as the Empress Irene books, but this one is fine as an episodic, standalone novel (it’s the second of the three). A former empress, now private citizen has taken a top class warship and become a trader and her first job is blockade running. There’s some cool stuff with Chandler’s version of hyperspace/hyperdrive/warp speed – which actually seems more like Dune style ‘folding space’ (they’re outside of space-time and there’s stuff about synchronizing and the like but… I mean, it’s all just hyperdrives, really). A lot of stuff about figuring out legal ways to open fire while smuggling and without violating space law. The book is a fast an enjoyable read. Style-wise, it reminded me of a less didactic Gordon Dickson (though I’m basing that on a single novel by Dickson, None But Man) and it’s a decent example of silver age sci fi. If you like that stuff and you see it in a used bookstore, pick it up. If you don’t, then you’re probably not browsing the science fiction stacks anyway, so I don’t imagine that it will come up. Myself, I found this in an awesome little bookstore in Dunedin, Florida called Back in the Day Books that is well stocked in cool little semi-rarities like this (I’ve also gotten a ton of old pulp magazines from them, as well).